Tony Romo shrugged off a successful cameo like it was no big deal. Romo threw his first touchdown pass in nearly 14 months and the playoff-bound Dallas Cowboys played it safe in a 27-13 loss to the Philadelphia Eagles on Sunday. "You expect to go out there and do something well," Romo said. "It felt normal." The Cowboys (13-3) locked up the No. 1 seed and home-field advantage throughout the NFC playoffs when the Eagles (7-9) beat the Giants on Dec. 22. So Dak Prescott played only two series and Ezekiel Elliott watched from the sideline. Romo finished 3 for 4 for 29 yards in his first regular-season game since Thanksgiving 2015 when he broke his left collarbone for the second time in less than three months. "It's enjoyable to have a little success, but I kind of do that at practice each day," Romo said. "Ultimately, you are going to be defined by what you do on Sunday, but in my experience, if you're not doing it throughout the week, Sunday is going to be difficult." Carson Wentz tossed two TD passes to Zach Ertz to help Philadelphia finish with a two-game winning streak. Prescott was 4 for 8 for 37 yards before giving way to Romo, the league's most expensive backup. Romo broke a bone in his back in the third preseason game against Seattle this season, paving the way for Prescott to have one of the best years by a rookie quarterback in NFL history. "I want the football every possession, but it was fun to watch Tony make it look so easy," Prescott said. Romo overthrew Terrance Williams on a deep pass on his first play. His first completion was a 16-yarder to Williams on third-and-12. After Dez Bryant drew a pass interference penalty on a deep pass at the Eagles 3, Romo connected with Williams for his first TD pass since Nov. 22, 2015 against Miami. 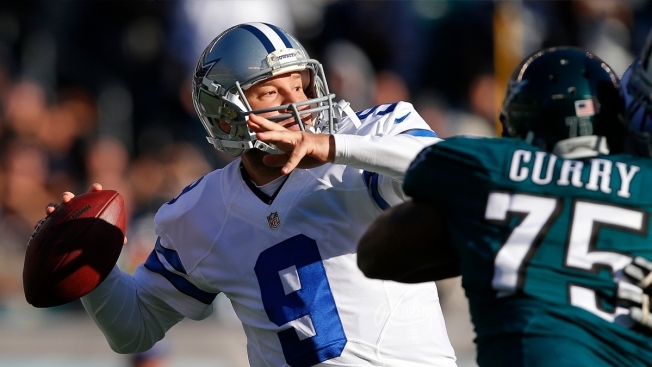 "If you're going to play, might as well be aggressive with the reads," Romo said. Mark Sanchez replaced Romo and threw two interceptions to Jordan Hicks in the second quarter. The Eagles took advantage of the second one at the Cowboys 49. Wentz tossed a 6-yard TD pass to Ertz to tie it at 10 going into halftime. Wentz fired a 20-yard TD pass to Ertz in the third quarter to give Philadelphia a 17-13 lead. Wentz ran over to Ertz, grabbed the ball, jogged over to two-time AL MVP Mike Trout and handed it to him. Trout grew up in nearby Millville, New Jersey and has season tickets for the Eagles on the field behind one of the goal posts. "You have to have fun out there," Wentz said. "This is still a kid's game they are paying us way too much money to play." Terrell Watson ran in from the 1 for his first career TD to extend Philadelphia's lead after a blocked punt late in the fourth quarter. Three Cowboys starters were inactive: LT Tyron Smith, CB Morris Claiborne, DE Tyrone Crawford. LB Sean Lee dressed but didn't play. Elliott finished with 1,631 yards rushing, 178 yards shy of breaking Eric Dickerson's single-season rookie record. Elliott is the NFL's rushing champion. Dallas had a successful regular season, but it won't mean anything if they don't advance deep in January. The Cowboys haven't won a Super Bowl in 20 years. "The only thing that matters is what we do now," coach Jason Garrett said. "We have put ourselves in a great position and it's time to get back to work." Cowboys WR Terrance Williams gets overlooked with Prescott, Elliott, Bryant, Jason Witten and Cole Beasley getting more attention. But Williams has a big fan in Romo. "He's one of the most underrated, if not the most underrated receivers in the league," Romo said. "He's a really great player." The Cowboys would be in trouble if they have to turn to Mark Sanchez. He was 9 of 17 for 85 yards and threw two interceptions to Jordan Hicks. Wentz broke Sam Bradford's record for most completions by a rookie. Bradford had 354 completions in 2010 after St. Louis selected him with the No. 1 overall pick. Wentz finished with 379 complete passes. ... Caleb Sturgis set a franchise record with 34 field goals in a season. Cowboys: First-round bye and a home playoff game on Jan. 15.